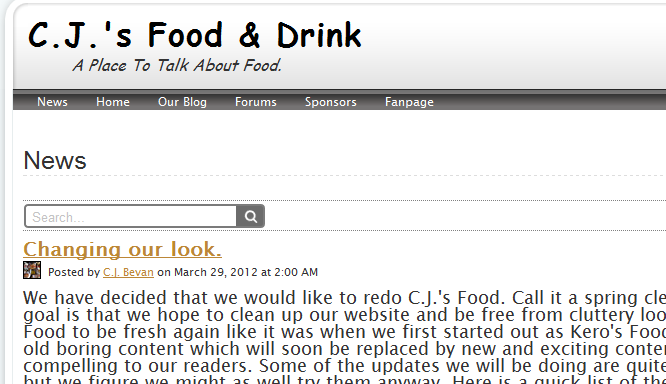 We have decided that we would like to redo C.J. 's Food. Call it a spring cleaning, if you may. What our goal is that we hope to clean up our website and be free from cluttery looking content. We want C.J. 's Food to be fresh again like it was when we first started out as Kero's Food. We have dumped a lot of old boring content which will soon be replaced by new and exciting content that will be more compelling to our readers. Some of the updates we will be doing are quite out of our levels of comfort, but we figure we might as well try them anyway. Here is a quick list of the content we will be making changes to. - Template: We are going to be switching to a lighter brighter template. - Our old blog has been changed to our news section of the site(This page). - Our Forums have been totally redone. We have deleted a lot of content and will be working to put in our new content. These are just some of the updates that we will be working on over the next few weeks or so. We figure to be done most of it by April 3rd. We would to thank all of our fans for supporting us during this time and we hope that you will enjoy our new content as well as the new look. - C.J.’s Food. Find great content like this and more at C.J. 's Food and Drink official website atwww.CJSFood.com. Also find us on Facebook. Questions? Comments? We would love to here them. 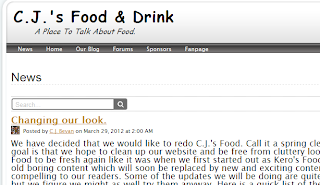 Send us an email at ourblog@cjsfood.com or leave a comment below.